It’s Monday again. How does this keep happening every single week? I need to talk to someone’s supervisor. Did you know that Christopher Nolan was attached to a movie remake of the 1967 Patrick McGoohan series The Prisoner? There have actually been development rumors of a Prisoner movie going all the way back to 2001. My CineScape best of 2001 has it listed among it’s list of 25 movies that didn’t get finished before the end of the year. Back then the rumors were that Simon West was going to direct the movie and Brad Pitt was rumored to be one of the actors. Simon West had decided to work on Tomb Raider since it was ready to go and at the time of publication was slated to work on the pirate movie Black Flag. There is no reference of any involvement with the movie on his Wikipedia page. But upon further research I did discover that Christopher Nolan had interest in doing a movie based on the cult tv series. In October of 2006, during a Q&A held after a screening of his first movie, Following, Nolan talked up the then upcoming The Dark Knight, as well as his desire to direct a The Prisoner movie. Helmer also talks The Prisoner. Nolan was also asked during the event about his plans to direct the big-screen version of the TV classic, The Prisoner. Back In August of 2006 reports were coming out connected to a Variety report that Christopher was taking the movie next once The Dark Knight was completed. The report also said that the husband/wife writing team of Janet and David Peoples who wrote the script for 12 Monkeys were attached to the project as well. However, by 2009 things had changed. Sites like the Collider and The Prisoner Online were reporting that Christopher Nolan was no longer working on the project, and instead had taken the helm of Inception. So Mr. Nolan was gone, went on to make Inception and more Batman. According to The Prisoner Online, produced Barry Mendel had not given up on the project. Speaking at the Australian premiere of Funny People, producer Barry Mendel said plans are still afoot to revive The Prisoner as a feature film, “Chris Nolan has dropped out of it but we have a first draft by David and Janet Peoples who wrote Twelve Monkeys and David wrote Unforgiven and it’s a good draft and we’re working on the script right now,” he said. “If the series was wildly popular that might effect us but the screenplay that David and Janet wrote was such a re-imagination of the series, if you think of The Avengers that wasn’t a commercially successful film but it was very much in the spirit of the original show,” he explained. As of this writing the series has come and gone with mixed reviews, garnering a 45/100 on MetaCritic. There has been nothing new about the movie since the miniseries was in production in 2009, and that’s probably for the best. While a Nolan take could have been interesting, I don’t know how well it would have done. 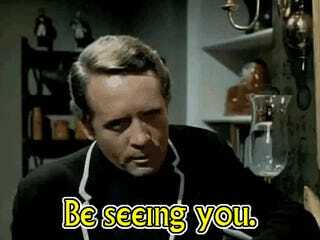 The Prisoner was always a cult classic but outside of sci-fi circles I don’t know how well a movie would have done. The story is also very Cold War centric and while it could be changed for modern day, it would lose some of what made the show so interesting. Well, it doesn’t look like it’s being made, and so as the cows say, it’s a moo point. I hope you all have a great rest of the day and i’ll see you all on the next Fact Of The Day.